Among the transformative forces that jolted the Plains in the 18th and 19th centuries, none was more sweeping than the arrival of horses, which happened on the northern Plains in the 1730s. Horses reached the Iron Confederacy and the Niitsitapi around 1750 and were available to the Métis shortly thereafter. Horses allowed the Niitsitapi and Assiniboine to refine an existing Plains culture and they had even deeper impacts on the Cree. The culture of the Great Plains was being made over in a southwest to northeast direction. The Assiniboine adopted the horse culture shortly after the Shoshoni and then coached their Cree allies. The hundred years that followed would see elements of the Woodland and Swampy Cree move farther and farther into the Plains. Mounted, the Cree became a cavalry capable of raiding neighbours with speed and impunity. This era, sometimes called the “Horse Wars,” had a revolutionary effect on Plains culture. The horse had its own needs, potential, and limitations. It could not flourish in the subarctic or in the swampy lowlands. Where it did well, however, it made possible a burgeoning of Plains people’s arts and crafts. The feathered headdress or war bonnet so utterly associated with Plains peoples in 20th century popular culture came into widespread use in these years simply because it could be carried from place to place more easily and it was no longer competing with other goods and belongings for space on a dog-pulled travois. As a weapon in war and in the harvest of bison, the horse knew no peer on the Plains. As an instrument leading to an improved quality of life, it was unprecedented. And it would, as well, contribute to a coming catastrophe. By 1818 horses were everywhere in abundance and literally eating into the bison range. 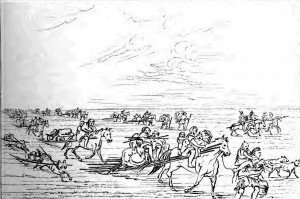 Figure 8.13 George Catlin’s ca.1850s sketch of Sioux making use of dogs and horses to move camp. Despite the arrival of horses, the Plains Cree still made use of enormous numbers of dogs in the mid-19th century. Assiniboine dogs — thought to be either wolves or recent descendants of wolves — were also used in their hundreds. Although hunting dogs worked and lived closely with Aboriginal men, the larger pack was the responsibility of women in Plains culture; they had to attend to everything from their feeding to training as pack animals to the culling of litters and preparing dog flesh for ceremonial feasts. It appears that the arrival of the horse enabled Plains populations of dogs to grow. Accounts survive of as many as a thousand dogs in one encampment, and many European travellers commented on the howling and whining of Aboriginal hounds. Historians remain divided on the character and depth of alliances and animosities on the Plains. This disagreement arises from inconsistencies in the written record and gaps in the oral accounts. What is certain is that the Cree emerged as a powerhouse in the parkland and farther north in the early fur trade period (ca. 1680-1750). Their effective monopoly on HBC goods paired with Anishinaabeg control over much of the trade coming out of Montreal before the Conquest, and Assiniboine military strength meant that the Iron Confederacy members moved from being on the geographic and economic periphery of the North American trade system to being leaders. The Spanish would not trade guns to the nations of the south and southwest, and the French had issues with some of the Plains nations. The British-supplied Cree and Anishinaabeg — along with their partners the Assiniboine — enjoyed a privileged position. And being better armed they were able to protect that interest as they moved in greater numbers onto the Plains. One of their rival groups, the Shoshoni, felt the effects of this changed balance. The Shoshoni had an outstanding reputation as makers of sinew-backed bows, a commodity they had customarily traded northward to the Niitsitapi, the Cree, and others. With iron arrowheads, these bows were lethally accurate weapons in war and in hunting, much more so than pre-19th century guns. (As late as 1811 it was reported that Piikani of the Niitsitapi Confederacy reckoned that a Shoshoni bow was worth a horse or a gun.) The Shoshoni also had, by the early 18th century, access to Spanish horses via southern neighbours and allies, and used them for raiding. The horse gave them a great advantage in battles in the 1730s against the Niitsitapi and the Cree, not least because of the shock value of these alien animals. Shoshoni raids deep into the South Saskatchewan River drainage in the mid-18th century, however, found the Cree well armed with English guns and very effective as marksmen. Guns turned the tide of Shoshoni dominance on the northern Plains. The Cree armed their sometimes-allies the Niitsitapi, and the Shoshoni were driven south. Once the Iron and the Niitsitapi Confederacies acquired horses of their own, the balance of power between those two sides shifted. 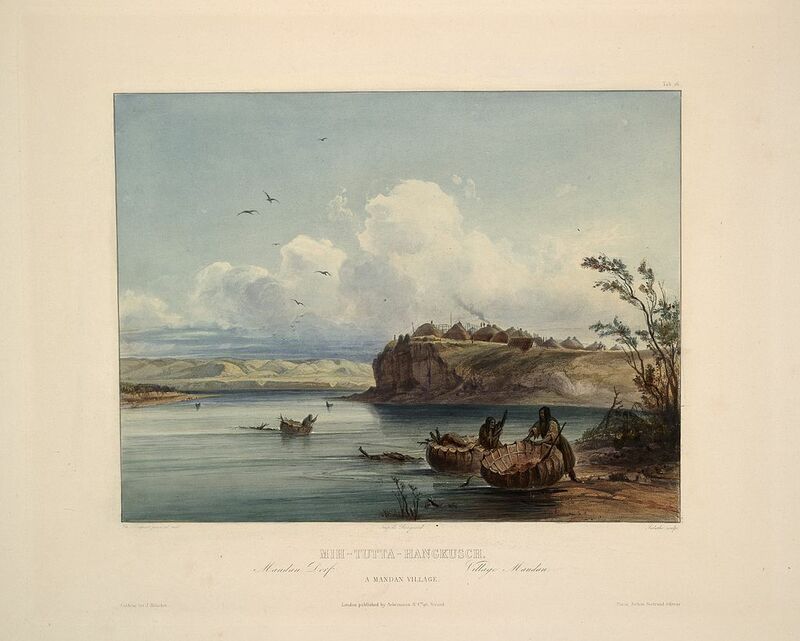 Without a common enemy to their south, the Niitsitapi and the Cree-Assiniboine found themselves in conflict over trade, the supply of horses, access to gunpowder and shot, and the locations of British and Canadian fur trade posts. These developments collectively contributed to the emergence of a common “Plains Indian” culture in the late 18th century. Mounted, well-armed, and capable of riding and shooting in large numbers — whether at enemies or bison herds — the Cree, Assiniboine, Plains Anishinaabe, and the Niitsitapi became a different kind of society. Better food supplies allowed their population to grow and life expectancies to improve. The stratifications in Niitsitapi society became more elaborate; the size of tipi rings enlarged; encampments grew from 50 to 200 individuals. For women, it is likely that the bison tradition emerging in the late 18th century was a setback. The hunt and warfare became a greater preoccupation and source of prestige for men, while women’s work increased in the butchering and preparation of meat. Nevertheless, the changes that occurred in the 18th and 19th centuries were partly a product of women’s roles. Warfare and raids often entailed the capture and abduction of women and, of course, sometimes women moved from one society to another under less violent circumstances. They brought with them their skills in making handicrafts, clothes, tipis, and food, as well as their language, as they settled into a new, perhaps married, life in the adoptive community. These aspects of material and non-material culture were the property of women and were diverse and changing. Women in Niitsitapi culture, for example, were recognized as conduits for change and agents of adaptability. The emergent Plains culture owed almost as much to women as it did to horses and guns. Aboriginal women played a comparable transformative role in fur trade society as well. Figure 8.15 19th century English photographer Eadweard Muybridge took an interest in the gait of animals in motion. His study of a bison gives a sense of its mass and power. The arrival of horses on the northern Plains had a revolutionary impact on Aboriginal cultures, economies, and relations with neighbours and newcomers. The power and influence of the Woods and Plains Cree increased dramatically in the years after the arrival of horses, gradually making them the most numerous and dominant force on the Plains. The emergence of common elements of a Plains culture in the 18th and 19th century was tied to increased dependence on the bison herds. 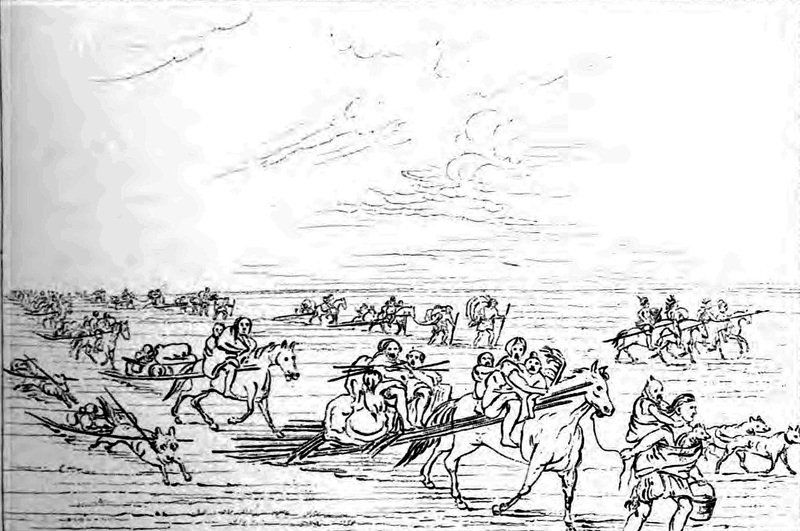 Band of Sioux Moving Camp by George Catlin is in the public domain. This image is from the Smithsonian American Art Museum and cannot be used for commercial purposes. Karl Bodmer Travels in America (49) by John Sweeney is in the public domain. Muybridge Buffalo galloping by Leonid 2 is in the public domain. 8.7 Cultural Change on the Plains by John Douglas Belshaw is licensed under a Creative Commons Attribution 4.0 International License, except where otherwise noted.